Nitra is a city in western Slovakia, situated at the foot of Zobor Mountain in the valley of the river Nitra. 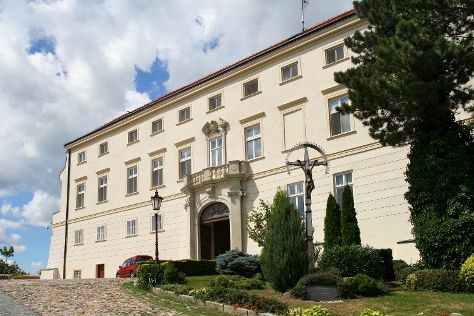 Start off your visit on the 31st (Mon): make a trip to Malá synagóga - Gallery, take in the architecture and atmosphere at St. John the Baptist Cathedral, enjoy breathtaking views from City Tower, then browse the collection at Chateau Appony, and finally explore the historical opulence of Nitra Castle. Get ready for a full day of sightseeing on the 1st (Tue): stroll through Park na Sihoti, see the interesting displays at Diecezne Muzeum, then pause for some serene contemplation at Church of St. Michael the Archangel, and finally relax and rejuvenate at some of the top local wellness centers. To find ratings, traveler tips, and more tourist information, go to the Nitra trip generator. If you are flying in from United States, the closest major airport is M. R. Štefánik Airport. In October, daily temperatures in Nitra can reach 60°F, while at night they dip to 44°F.